TMNT's villain and mentor are revealed in new retrospective of franchise history. 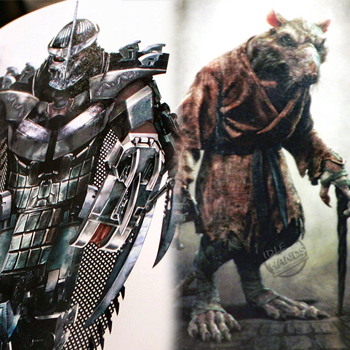 The redesigns of the Teenage Mutant Ninja Turtles in the new Michael Bay-produced live-action feature adaptation have met with mixed reactions from longtime fans; but thus far the film's other two (known) major characters, the evil Shredder and wise Master Splinter, have only been seen in fleeting glimpses. Not anymore. Toy blog Idle Hands has an early look at the upcoming art book TMNT: The Ultimate Visual History, which covers the evolution of the franchise from its beginnings to the present in unprecedented detail. From its pages they've culled the first good looks at the characters as they'll appear in the new movie (no official publicity stills have yet been released). Of the two, Splinter will likely look the most familiar: A human-sized bipedal rat with gray/brown fur wearing a red-ish robe (the colors in the photo are a bit washed-out), he looks very close to his design from the first animated series. Shredder is a more dramatic overhaul, but still recognizable, with bulkier armor and larger blades than previous incarnations and a cape that appears to be itself made of razors. Tony Shalhoub is voicing Splinter, while William Fichtner is playing Erich Sachs - a nefarious businessman who becomes this iteration's version of The Shredder.